Session fees are payable either in advance (via bank transfer) or at the end of each session by cash or card (I accept most cards). I can also offer Skype sessions (payable in advance) for regular clients and those not able to get to Bristol. For more information on the services I offer, see my sessions page. 1-1.5 hour consultation and bespoke hypnosis recording, created personally for you, from the information obtained in your consultation. Follow up sessions charged at £40 per session. I offer discounted sessions to people on low income / benefits and for block bookings (paid in advance). 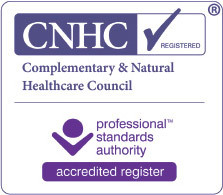 As a registered practitioner with the Complementary and Natural Healthcare Council (CNHC), some private healthcare providers may contribute to your session fees. Please check with your provider. Please note that I operate a 24 hour cancellation policy. Bookings cancelled with less than 24 hours notice, or missed appointments will be charged at ½ price unless there is a genuine reason. Please let me know as soon as possible if you wish to re-schedule your appointment so that I can offer your appointment slot to someone else.